A tian is a Mediterranean dish, more specifically from Provence, which consists of thinly sliced vegetables slowly roasted in the oven. It could be made with any seasonally available ingredients such as artichokes, asparagus, eggplant, potatoes, broccoli, carrots, celery or mushrooms. I've also seen it made with meat or fish as well, but today I made a version that is very popular. 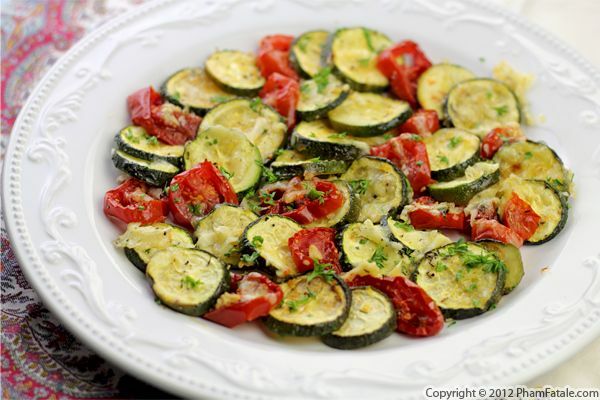 It consists of garlic, tomatoes and zucchini, which happen to be fresh from our garden. I arranged the three ingredients in a terra cotta dish and drizzled on a little olive oil with freshly chopped herbs. 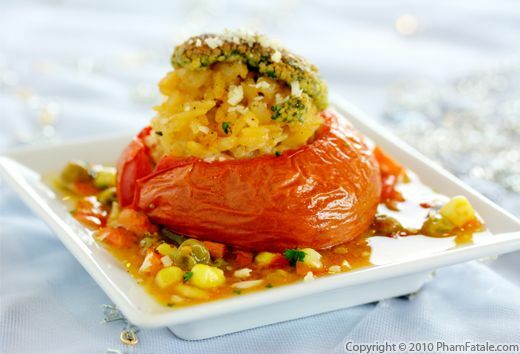 The dish is very easy to prepare, and tastes as good as it looks. If you love cooking with farm fresh ingredients, don't forget to check out Full Circle. We're giving away one box this week. One lucky winner will get a free box of organic farm fresh home-delivered produce. To enter, just type your name and email address into the box below. The winner can choose any size box. The largest Full Circle offers is Harvest, which is $42 in CA, $45 in WA/ID, and $56 in AK (shipping not included outside of Anchorage). The summer weather in the Bay Area hasn't been so great this year, and on top of that, an infestation of gophers in our garden forced us to grow fewer tomatoes in small planters this year. Not only are there fewer varieties, but because of the lack of heat the plants have not been all that prolific. I gathered a couple of handfuls of the few ripe cherry tomatoes I could find and I was determined to do something special with them. To start, I slowly roasted them in the oven. I could have stopped there and just served them in a salad, but I opted to make my husband's favorite comfort food: risotto. Risotto is extraordinarily versatile (I've developed multiple variations) and perfect for any occasion. For this version, I used Carnaroli rice, which holds its shape better than Arborio rice. For a bit more texture, I mixed in melon-seed macaroni (similar rice-shaped pasta). The combination has a creamy mouthfeel, so no heavy cream is necessary. I colored the dish with sharp yellow Cheddar cheese and served it to all the vegetarians in the house. I think it ended up being a perfect send off for the fruits of our labor. Caprese salad is a simple and easy recipe. It consists of stacked slices of buffalo mozzarella, tomatoes and basil, seasoned with a drizzle of olive oil and balsamic vinegar. 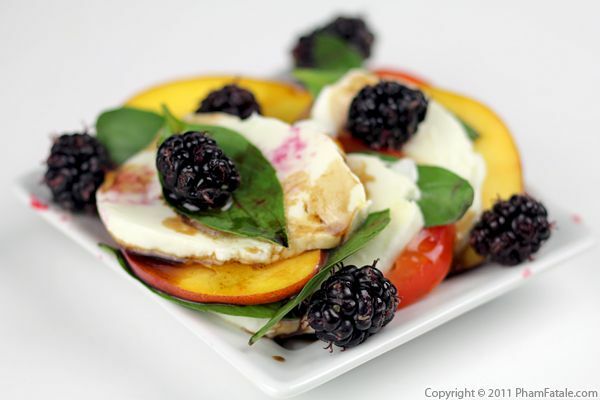 To mix things up, I made an Asian variation of this salad, adding stone fruit and berries. I drizzled toasted sesame oil and plum vinegar to season the salad. Unlike berries, this year has been a bummer for the tomatoes in our garden. My husband Lulu has been struggling with the vegetables he planted. Since last year, we've been fighting gophers and rabbits. So to avoid the proliferation of these animals, we decided to install several elevated tomato planters. Unfortunately, this method has attracted all the deer from the neighborhood. They don't eat the fruit, but they do devour all the young sprouts. I managed to gather a few ripe tomatoes and made salads, but there aren't enough to can any tomato sauce this year! 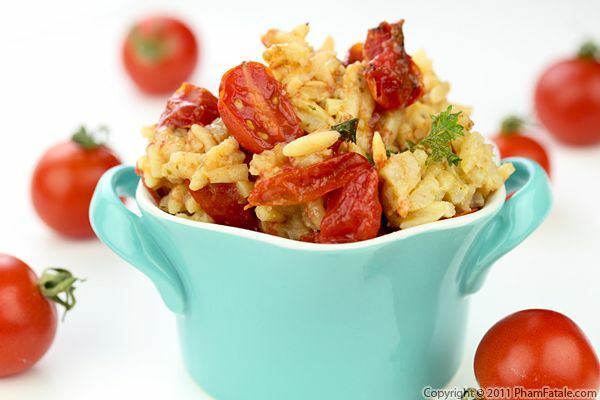 This version of tomato risotto has a decidedly Indian sensibility. I flavored the rice with tomato chutney as I recently did with an Indian-inspired asparagus pie. 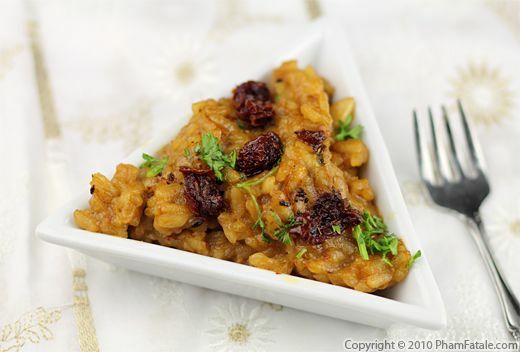 The flavors from the chutney are so bold that no other spices and very little salt are needed. I just added chopped sun-dried tomatoes as garnish. Making risotto takes a little bit of practice to begin with, but once you've worked on your fundamentals, you can start to use the basic recipe and create dozens of different variations. I've stuffed artichokes with risotto, paired pistachio pesto with celery risotto, stuffed it in zucchini flowers, made a roasted beet and ricotta cheese version, and also a rather unconventional risotto with bamboo; the list of adaptations is truly endless.